Louis shouldn’t have been shocked to hear that Cahill was going after Pearson Specter again. After all, Cahill hates Harvey just as much as the rest of the New York legal scene. Ironically, Cahill was still trying to get Harvey and Mike on bogus collusion charges. He wasn’t even looking for any wrongdoings by Louis Litt, the world’s most upstanding citizen. Because no one would have believed Louis was capable of such shady behavior, Mike and Harvey were still under the impression they had nothing to hide for most of the episode. And between the two of them, they didn’t. So the decision to just hand over all their Gillis Industries files to Cahill made sense for two people who didn’t collude. Unfortunately, that left Louis with two choices: replace the document outlining his misdeeds with a clean forgery, or tell the truth. Thank god he didn’t go with Katrina’s advice on this one. She only had his best interests at heart, but Louis would have never been able to live with himself if he had chosen to replace the document. Of course, now his future at the firm (and possibly as a lawyer) are in serious jeopardy. This is even scarier than when Donna was briefly fired a few seasons ago. You always had the sense that she would be brought back eventually. Not only is it possible that Louis will never be allowed to practice law again after this, but there’s a chance he may end up in jail. Louis is this show’s MVP, so losing him would be criminal. But keeping him at Pearson Specter for much longer is looking increasingly difficult. Hopefully Cahill and Sanders get Litt up, or else Louis is in for a world of trouble. Elsewhere, there was the whole Mike and Rachel thing. Which, thank god, looks to at least be moving in the right direction. As poorly as Rachel has handled the entire situation, the toll her mistake was taking on both her professional and personal lives was heartbreaking to watch. And if I had to make a list of TV’s cutest couples (stay tuned), those two would be in the top five. It turned out that for once, Donna was wrong. As much as she and Mike insisted he needed space, that wasn’t going to solve any of their problems. As Rachel said, she was going to fight for their relationship until Mike told her to stop. It was nice to see feisty Rachel back in action, doing everything in her power to get Mike back. She made a good point: It must have been incredibly hard for her to erase the image of a scantily-clad Tess on Mike’s bed from her brain. Sure, Mike wasn’t cheating on her (though he was helping Tess cheat), but he did effectively ruin the moment they could’ve first gotten together. So Rachel was fully justified in telling Mike that he had to decide if he loved her more than he hated the image of her and Logan together. And thankfully, it appears he does. And finally, Donna finally told someone else about her hook-up with Harvey! Which also gave us a taste of Rachel’s catty side, as she threw that information back in Donna’s face at one point. Play nice ladies. 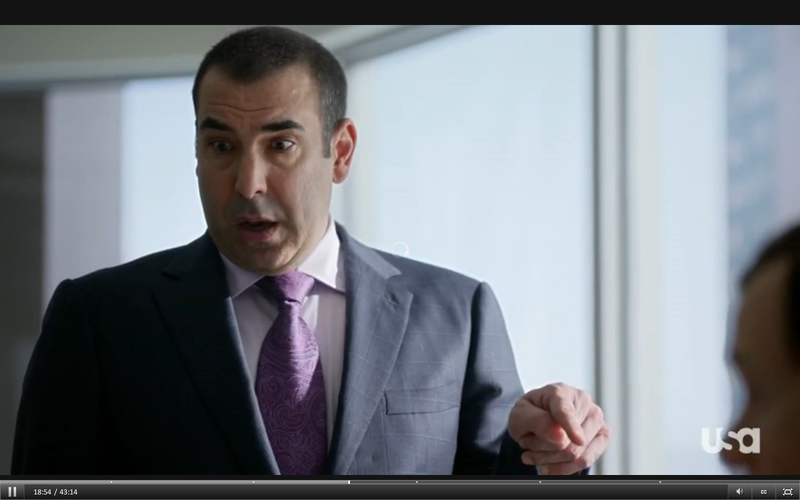 Pearson Specter is going to need all hands on deck next week to deal with an impending Cahill-Sanders attack and the world’s most apologetic Louis Litt.